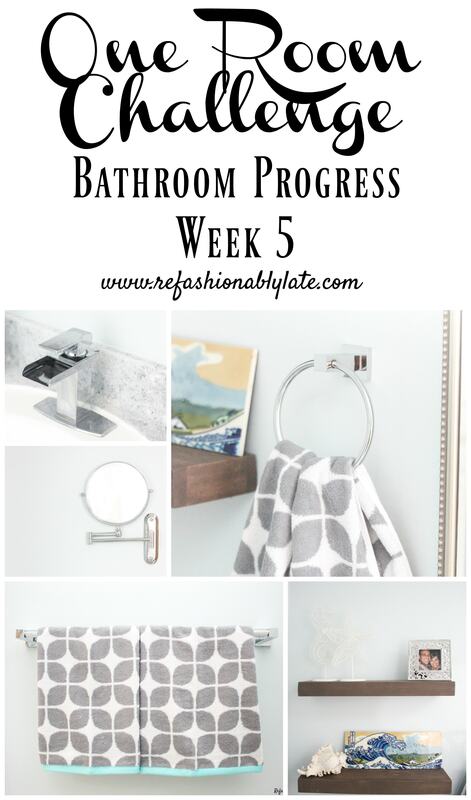 Here we are at week 5 of the One Room Challenge. Only one more week left!!! AAHH! I can’t believe I’m about to say this but all that is left is tiling! I never thought we would get so close to having this room done! We aren’t doing the tiling ourselves though so I guess officially we are off duty! 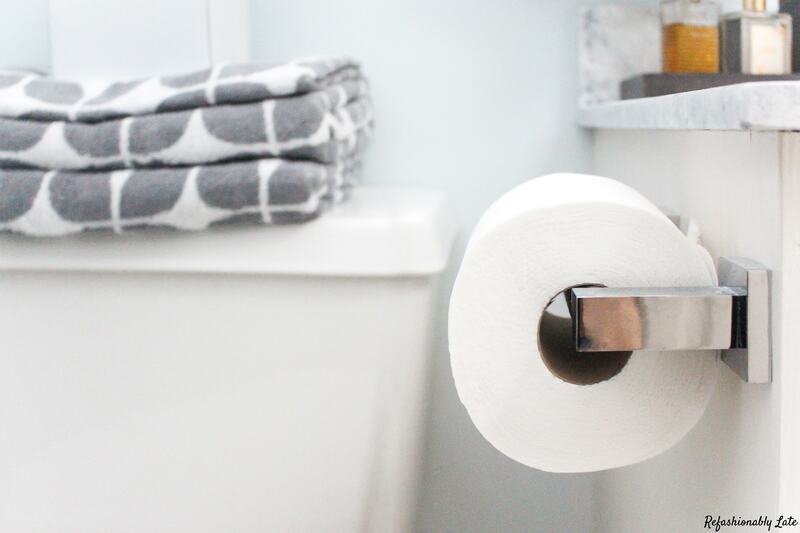 Today I’m sharing all about paying attention to detail. It’s the smaller items sometimes in a room that make a large impact! To start I want to reshare my hardware on my cabinets! I’m super obsessed with it and love how it looks in our room! I got the pulls from Hickory Hardware and I went with the 3 in Crystal Palace Crysacrylic in Bright Nickel . 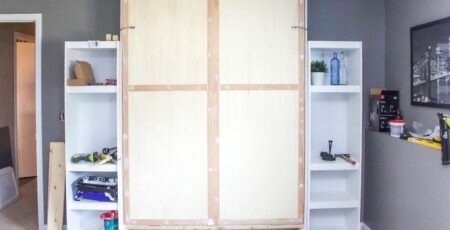 I actually won these pulls because I was one of the top two voted winners for the Hickory Hardware IKEA Challenge where I gave an IKEA Rast a makeover. I turned it into a Stemware Storage/Bar Cart . The knobs I got are Crystal Knobs by Threshold at Target. Let’s move to our new faucet. We had the traditional ugly 90s builder grade faucet and I hated it. It sprayed water everywhere and….was…well…ugly! I replaced it with this affordable faucet that I purchased off of Amazon. 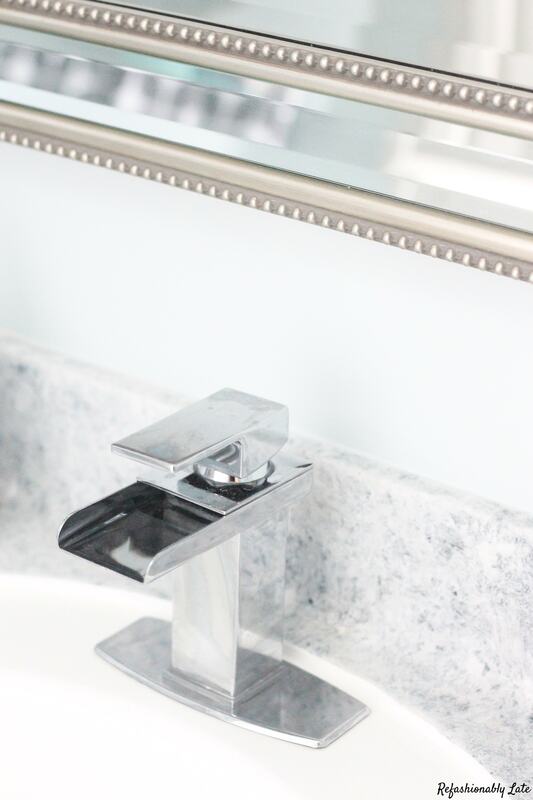 It’s a great Waterfall Faucet for the price! I replaced the toilet paper holder and towel rod in the bathroom. They were outdated among other things in our bathroom that needed an update. I went with unhinge for these products. 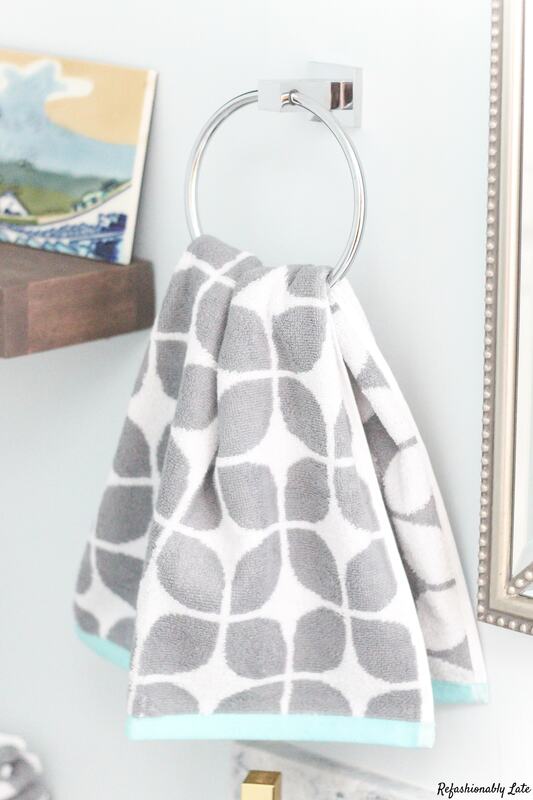 I really liked their SoHo line by ez-set and I so I got their Toilet Paper Holder , Towel Bar and Towel Ring all in Chrome. Lastly, I want to share with you my new shelves behind our toilet. We removed the giant cabinet and repaired the wall and replaced it with these floating shelves. 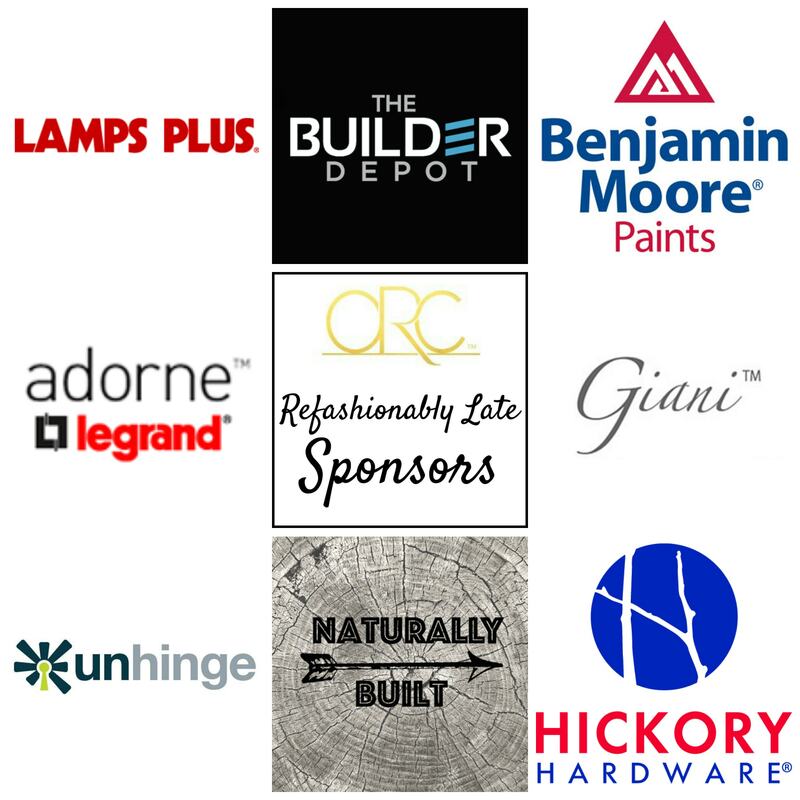 I want to thank all of my amazing sponsors! 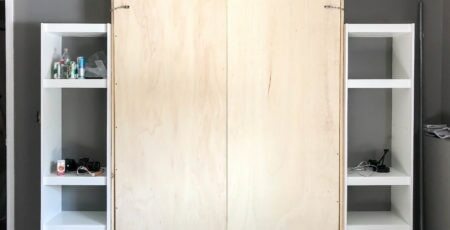 I hope you are as excited as I am for this room to be finished! 🙂 One more week and I can start to relax a little! I’ll see you next week with the final reveal! Everything looks great! The small touches make the space seem modern and refreshed. 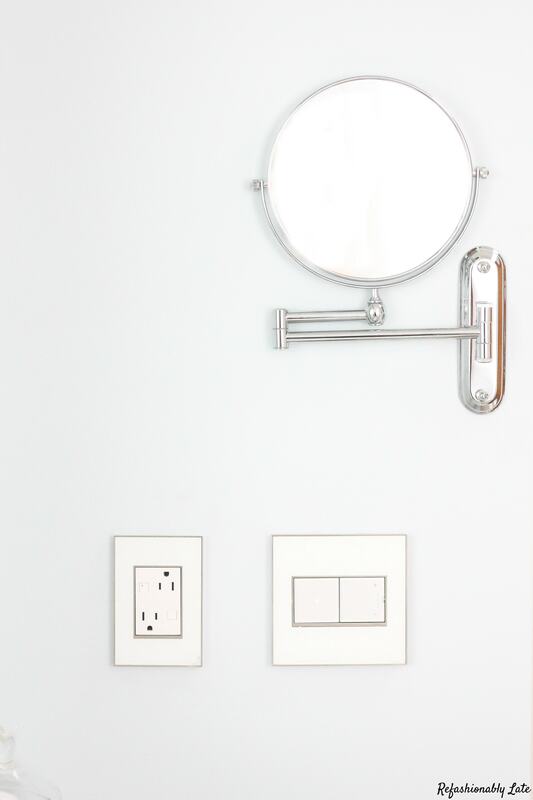 I love those light switches and socket plates! Thanks the switches and plates are my favorite! 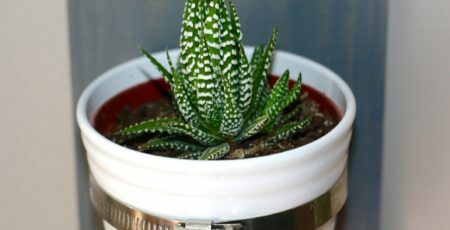 I have them in our entire upstairs and it’s such a cool addition to our home! Haha thanks Brittany! I am also surprised how good the faux marble looks! 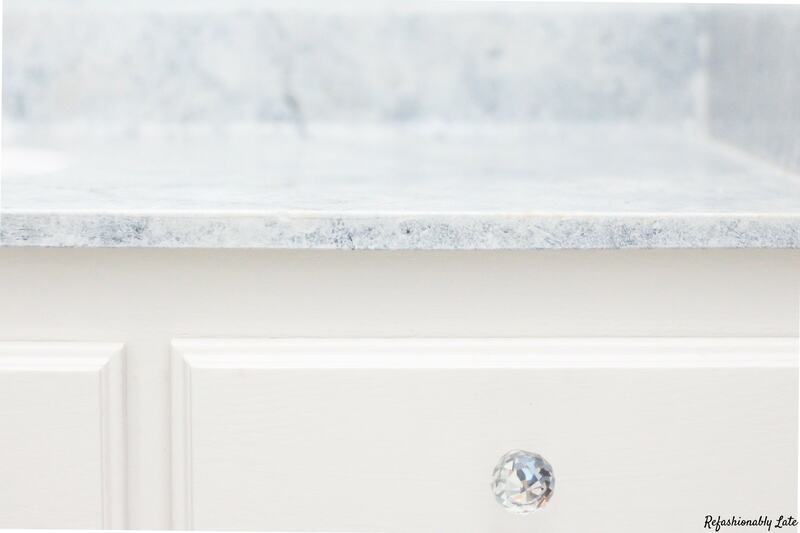 Such a quick and cheap fix for updating your counters! I love those handles! Very pretty details everywhere! 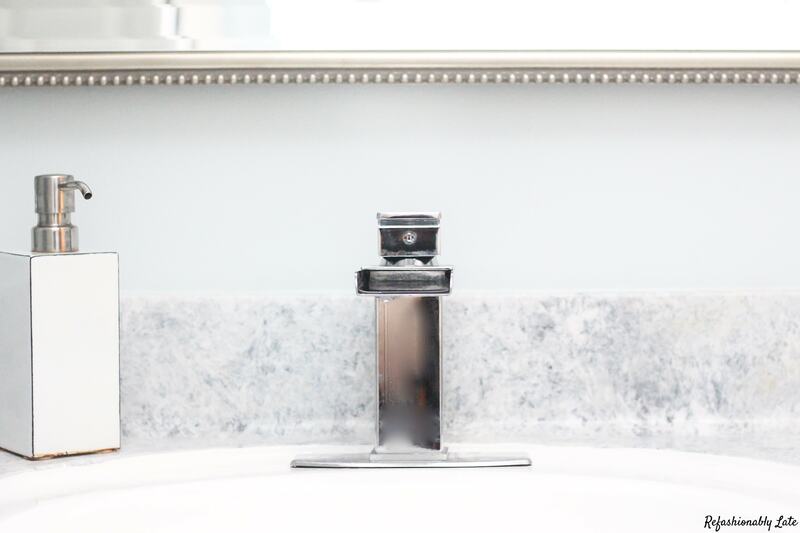 Love your new faucet! Can’t wait to see the full reveal! Ruthie, I’m swooning over your knobs and pulls. Great look for this room! Thank you so much Carol! I love them too! I’m loving all the little details! Can’t wait to see the full room! Love it! And what cute towels 🙂 I’m tackling my bath for ORC too and was so glad to have the push to get it D-O-N-E!! 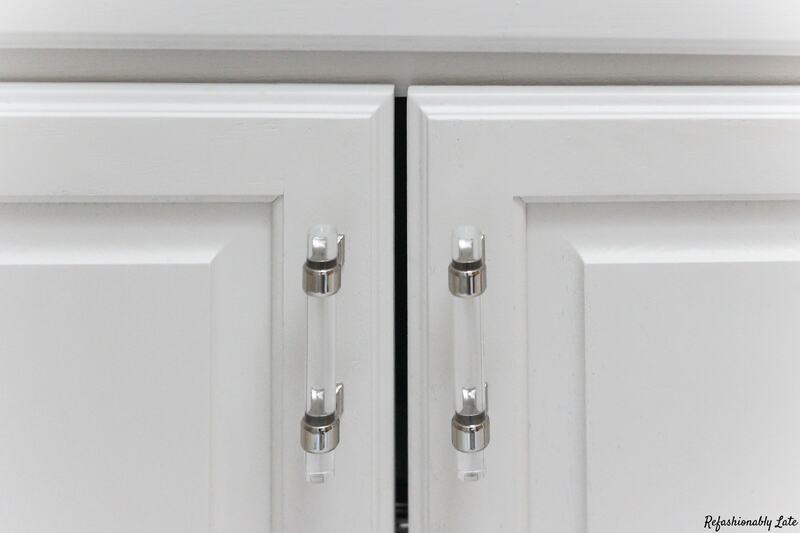 I LOVE the hardware for the cabinets! SO chic! And I can’t believe you are doing two rooms! Wow! 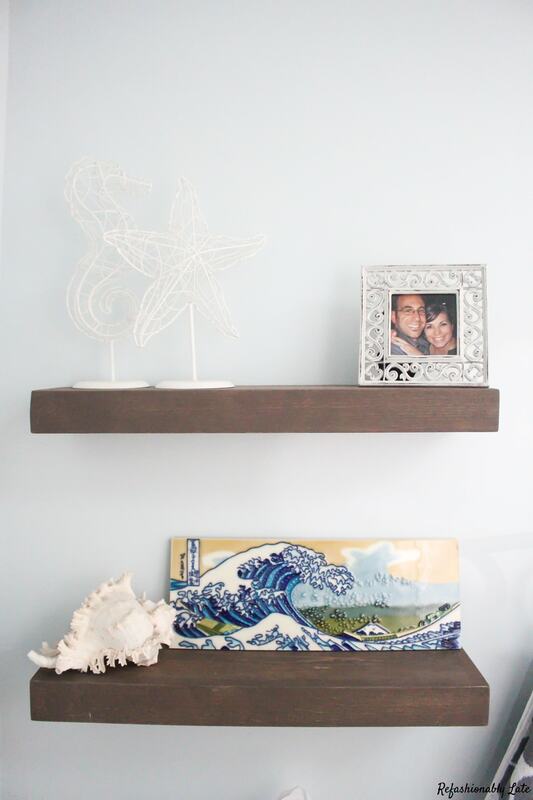 The shelves look wonderful with the beachy accents, everything blends so well. Nice job! I will be anxious to see the gran finale. Thanks Maria! I’m still trying to fine tune my decor choices but I’m glad you like it!! Thank you! Thank you Lindi! I’m so happy with how it’s coming together! Ruthie, I love a waterfall faucet! Just really adds something special to a bathroom. 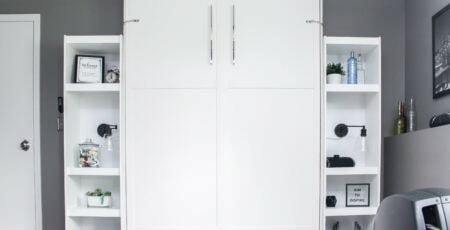 And don’t blame you on your cabinet hardware crush! They are beauties. Looking forward to seeing how everything comes together! Thanks Lynn! Waterfall faucets are so pretty and unique! I love how it fits in my bathroom! That hardware is so GLAM! I love everything! Beautiful! 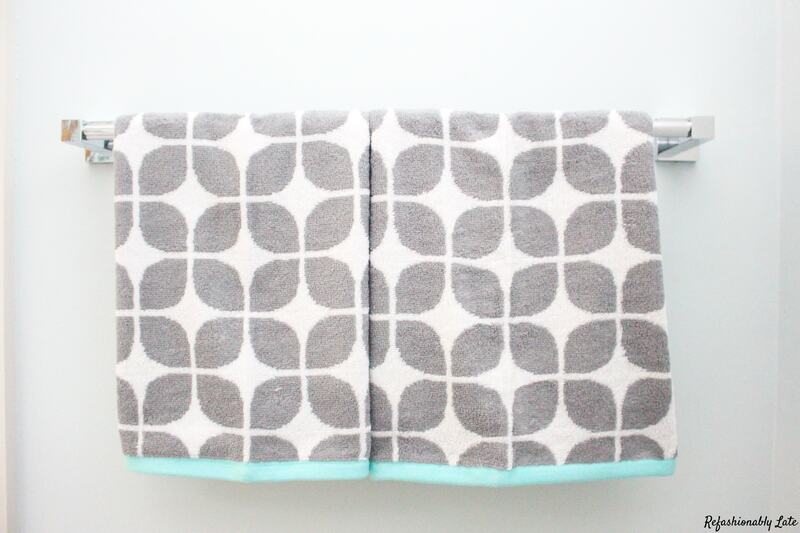 I love your floating shelves and those towels, it’s coming together!